I'm looking at this gun as my next purchase. The retail is more than twice that of a P-226 Elite. What would explain this difference? I don't have exp with the x-5 special ops, I do have alot of exp with a p226 Stainless steel elite, p220 Stainless steel elite sao, and p226 elite sao. I also currently have an x5 alround. Now, the X5 alraound has a full 5 inch barrel, squared non railed dust cover, better target sights and a superb da/sa trigger pull set. My long gone SSE 226 and SSE SAO 226 had Rails, the DA/SA was bad for the money. I eneded up putting a whole set of wolf springs in the SSE 226. I still did not warm to it. The 220 SSE SAO had a great single action trigger, combat sights. That damn ambi safety kept disengaging. It drove me nuckenfuts. My current guns are my p226 SAO (aluminum frame) and X-5 Alround. The ambi safety on this p226 is tighter and does not disengage during normal wear. The X-5 is quite a bit heavier. Both are as accurate as I am. THe P226 lends its self to self defense more so than the x5. Think of it as the Gen 2 X-Five Tactical. It is a gorgeous SAO German Mastershop gun. The finish has a bit of a metallic tint to it which is hard to explain until you see it in person. Unless I’m missing something, it’s way overpriced b/c it’s basically a P226 X5 Entry with an all black PVD finish. A brand new Entry just sold on GB for half that amount and when the Mastershop pistols were imported it was three to four hundred $ less than that. I've been looking at X-Five's for a while now and picked this one up last night. Hopefully, it'll be here by the weekend. ^^^ Good one, M. The XPRESS is the euro's name for the ENTRY that was originally sold in the US. 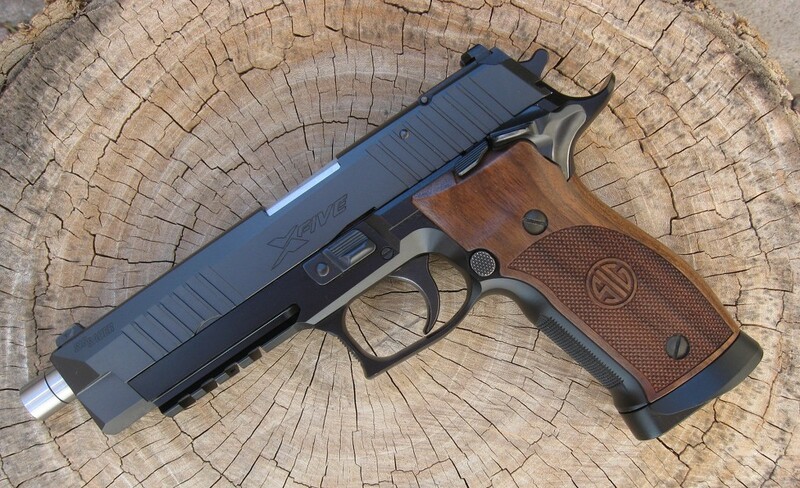 I wish SIG USA would make and sell those "E3" grips. I bet they will sell very well. ^^^^ that’s the exact same pistol I was referring to in my earlier post. Like I said, the Spec Ops is way overpriced. Yep, the X5 Special Ops is just a blackened ENTRY. But, GB sellers will hype it up to justify their asking prices. Thanks Q! Didn't come with the manual, target, or outer sleeve, but, it was advertised as being unfired and at a price that worked for me. I've been wanting to try the "E3" grips since I first came across them, however, I couldn't find a source in the States. Don't know about this model, but it looks a lot like the former P226 X-Five Tactical, although the Tactical had an alloy frame and no magwell. It was also not as expensive. I added a German magwell which I was able to order for the gun. I have the Tactical and it is, hands down, the best shooting SIG I have ever owned. Recoil is negligible and accuracy is incredible especially given I'm not that great.